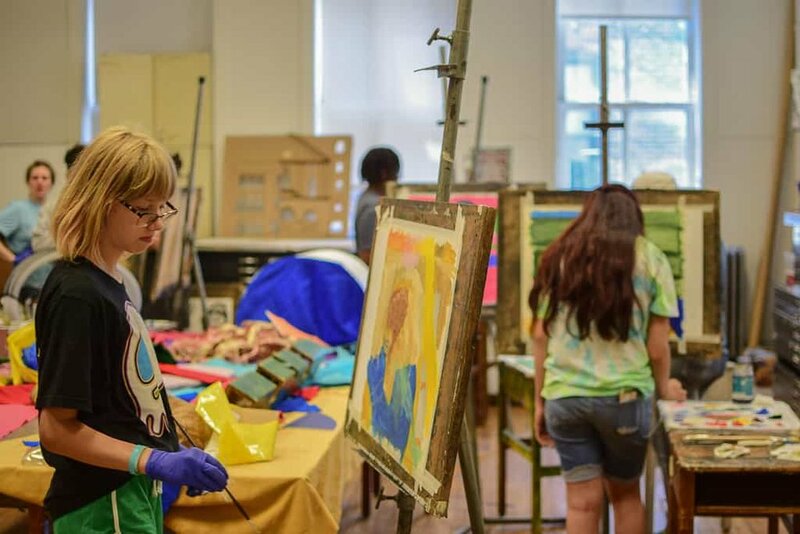 The Visual Arts Department facilities provides space for students to work as a class and flexibility for students to work privately on their own. Facilities include: A painting studio, in which students work primarily in oil paint; a sculpture studio with extensive tools and equipment for wide range of processes including working in wood, plaster, and mold making to name a view; printmaking studio has two presses and students work in various relief, lithography, intaglio, monotype, and screen printing processes; A design studio that is used for drawing and is flexible to accommodate special projects; and a Digital lab and library where have access to the Adobe Creative Suite as well as a vast collection of art books. The Visual Arts Department facilities provides space for students to work as a class and flexibility for students to work privately on their own including: Painting & Drawing Studio, Printmaking Shop, Design & Special Projects, Sculpture Studio, and Digital Lab and Library. The Visual Arts Department frequently visits galleries and museums. Students are expected to incorporate these influences in their own work and exhibit curation. In addition to figure drawing workshops, the Visual Arts Department breaks from regular class schedule for special all department collaborative projects, master classes and lectures by visiting artists. Throughout their time, students undergo different evaluation processes depending on their year. Critiques are held at regular intervals in each visual arts course. Freshman and sophomores individually consult with Visual Arts faculty at the end of each semester to discuss their strengths and room for growth. Through constructive criticism and self-evaluation students gain invaluable perspective on their work as artists. The Visual Arts Department evaluates students most intensely at the end of their junior year. Students present 15 works, including five in a series, and an artist’s statement to Visual Arts faculty and one academic instructor. Juniors prepare for this presentation –constructed to teach students how to articulate their point of view and process, and to prepare them for college –throughout the year, including by attending statement writing as well as other related seminars. Seniors apply for scholarships through the National Foundation for the Advancement in the Arts (NFAA) and spend the majority of the year preparing their thesis to be presented at their Senior Exhibition. The Visual Arts Department operates two galleries and presents five exhibitions per year that showcase student and alumni work. Student learn to curate, install and light exhibitions as well as write gallery texts and artist statements. Students also participate in exhibition opportunities outside of The Academy.